Correction to: Overweight and diabetes prevention: is a low-carbohydrate–high-fat diet recommendable? The original article can be found online at https://doi.org/10.1007/s00394-018-1636-y. In the original publication, the disclosure of potential conflicts of interest statement was not correct. The author spoke at a meeting of the European Starch Producers Association and EU commissioners (2017) about production and potential health effects of Iso-glucose. The author contributed to the Foundation-Kenniscentrum Suiker en Voeding (Knowledge Center Sugar and Food) for 2 evidence based educational videos about sugars, metabolism and health (2017) and prepared a text entitled “Voeding met een laag koolhydraat gehalte” (Food with a low carbohydrate content) for their educational newsletter (2018). 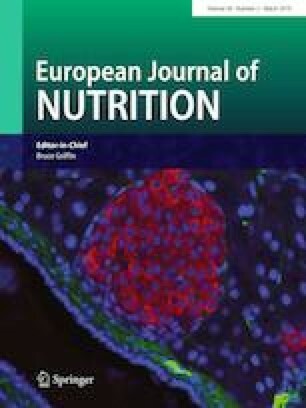 The author took part in an invited expert panel (2015–2017) convened by ILSI-EUROPE with the aim to review international nutrition and food based guidelines about sugars, carbohydrates, fibers and health published in EJCN ( https://doi.org/10.1038/s41430-017-0035-4).